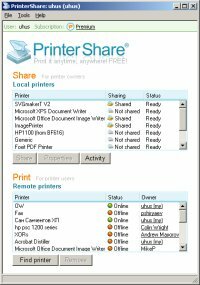 Download PrinterShare® Software – Print to any remote computer printer FREE! As makers and owners of PrinterShare® solution we can assure you that the original copy of the software available on www.printershare.com contains no spyware, malware, viruses or any other type of unwanted and potentially harmful software components that would be installed on your computer. We do not collect any information about you except for what’s needed for the PrinterShare® system to function (your customer profile). Such information will not be distributed or sold to any third parties. We cannot be responsible for copies of the software downloaded from other websites that we don’t control. When you download PrinterShare® or update the version please always make sure it comes from our website www.printershare.com.